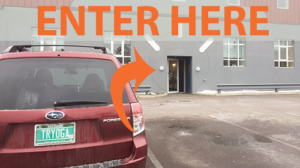 To find the location of Hot Yoga Burlington Studio, after finding 294 N. Winooski Ave, a large 2 story grey multi-use building. Enter the parking lot just besides the building (plenty of free parking for cars and bike racks). Use the side entrance just off the parking area to the back. 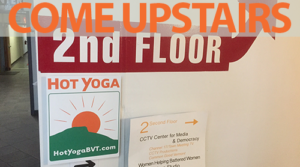 Follow the Hot Yoga signs upstairs. From Church street, looking toward the church at the top, turn right onto Pearl St. Walk one block to N. Winooski Ave., turn left. 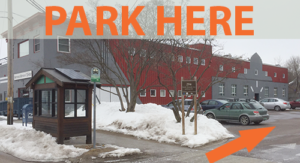 Walk 4 blocks to 294 N. Winooski Ave, which you will find on the right side of the road. Pearl St is at the N end of downtown. From downtown follow Pearl St east up the hill 2 blocks to N Union St. Turn left on to this one way st., follow for 2 blocks until it intersects with N Winooski Ave. Turn right for 1 block. 294 N Winooski will be on the right. Use parking lot and side entrance to the back of the building. Follow N. Prospect street away from campus 5 ½ blocks to the intersection of Archibald S. on the left. Archibald curves to the left through the graveyard. Walk down Archibald 2 blocks to N. Winooski. Turn left and enter 294 N. Winooski Ave. Enter the building through the entrance at the the back of the lot. Bike parking available. Driving directions from UVM, same as above.